Yes, all the way back in September, I stopped in just to grab a couple of items and get back to my life. My current, right-then, at-that-moment, life. The one we all deal with while it’s happening, if we are lucky, rather than trying to deal with that, plus the things that are three months away. I happened to be on that end of the store closest to the garden department and thought it would be quicker to go to the check-out register there than to walk to the other end of the store and stand in line. There, I ran into…the wall. No, not The Wall (the one dreamt of by small-minded men focused solely on solving 21st-Century problems with 1st-Century technologies.) This was a wall of trees. Fake trees. Okay, I’ll say it: fake Christmas trees. I’d previously been outraged about seeing this junk put out for sale in October, as any rational person should, but I had now witnessed commercialism sink to a new low. Led as always by Wal-Mart, retailers have been pushing this stuff earlier every year. When I was a kid, everyone complained that it was not even Thanksgiving yet and the Christmas stuff was already out. We’re pressured to do our Christmas shopping earlier every year and spend more money, yet we inevitably still hear about retailers complaining that sales figures haven’t met expectations. Well, retailers, perhaps your expectations are ridiculous. I for one am sick of this consumer-driven economy. It doesn’t matter how much we spend; retailers will never be happy with it. Think about it. When was the last time the news following the Christmas shopping season was about how pleased they were with their sales numbers? But I digress. Maybe it’s just me, or do other people love finding sale prices on revolting white, pink and blue plastic trees while sweat rolls off them by the gallon because it’s still 113 degrees in the garden department? Why don’t they just quit beating around the bush and just dedicate an entire aisle to Christmas sale items all year round? It would be less annoying because we would be used to it. 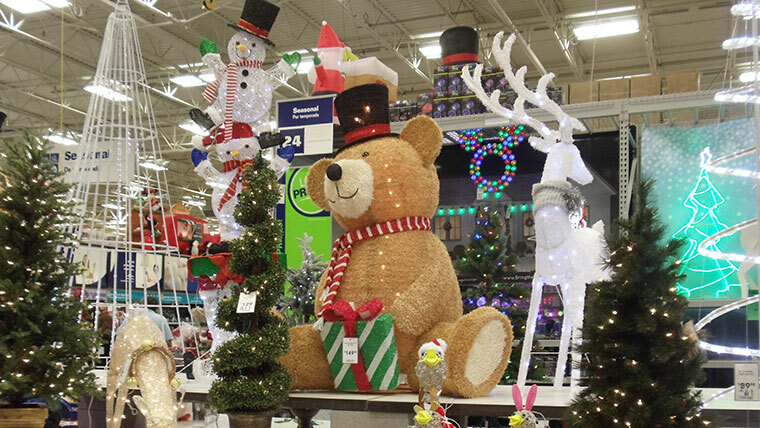 Now that I think of it, isn’t it about time for a Christmas super store? Wal-Mart could just add on to all of the existing Sam’s Clubs and then, when the new Christmas department really takes off, they can start building Christmas Club ™® locations all around the country. These superstores would be very popular in parts of the country that are especially concerned with referring to themselves as the Heartland and seem to feel persecuted every time they want to say “Merry Christmas” to someone. I have, for most of my life, been perplexed by the reality that I, an atheist, seem to have a better sense of the spirit of Christmas than people who call themselves Christians. I mean, if all people are concerned about at Christmastime is buying more junk to fill the voids in their empty lives or appease their spoiled kids, then they don’t seem to be getting much out of their espoused religion. Yes, I am an anomaly – an atheist who believes in Jesus. That is, I don’t believe him to have literally been the son of God, but I do feel that he was a great prophet who taught important lessons of civility, love, acceptance, fairness, tolerance, caring for our fellow man and taking care of those less fortunate members of our society, to name a few ideals. Therefore, I feel that his teachings should be respected. Maybe I didn’t pay close enough attention in vacation bible school because I don’t seem to remember his lessons about prizing material possessions and wealth above those other things. But modern believers seem to be convinced that the man most famous in human history for walking the earth in poverty and shunning wealth would be totally cool with several people every year getting trampled to death in the doorway of Target by hundreds of fellow shoppers. And for what – to save $50 on a new TV that will cover their entire wall instead of last year’s piece of crap that only covers half of it? Since this society is too far gone to remember what Christmas should be, I think I’ll start a movement to return to Paganism. I’m telling you, the Pagans had the right idea. Christmas was hijacked by men in the early Church who had an agenda to demonize Pagans by calling them Satanists. Their goal was to make converts, so they decided celebrate the birth of Jesus right on top of the biggest Pagan holiday, the winter solstice. When celebrating the shortest day of the year, Pagans would sacrifice various animals to the Gods – barbequed, of course. They would drink and dance and drink and socialize and drink and do all the fun things necessary to ensure a healthy crop of autumn babies. They would drink and eat and just have a great time. What’s wrong with that? The Pagan religion was worldwide before the Church unfairly set their sights on it. Pagans loved nature and each other and their families. They were not Satanists. Satanism was invented by the Church for the sole purpose of demonizing Paganism. We should take back both the winter solstice and Christmas by celebrating them on their original dates. In the Northern hemisphere, we would have another summer holiday (Jesus’ real birthday), and we could enjoy Thanksgiving by staying home and eating way too much instead of camping out in the parking lot of Best Buy. In the Southern Hemisphere they would finally get to have some white Christmases of their own. Maybe by doing this, we could shake things up enough to get people to remember what holidays are really supposed to be about. Now that I think of it, at least two retail industries would benefit from Paganism going mainstream: liquor outlets and baby-supply stores. Hey, capitalism always finds a way.